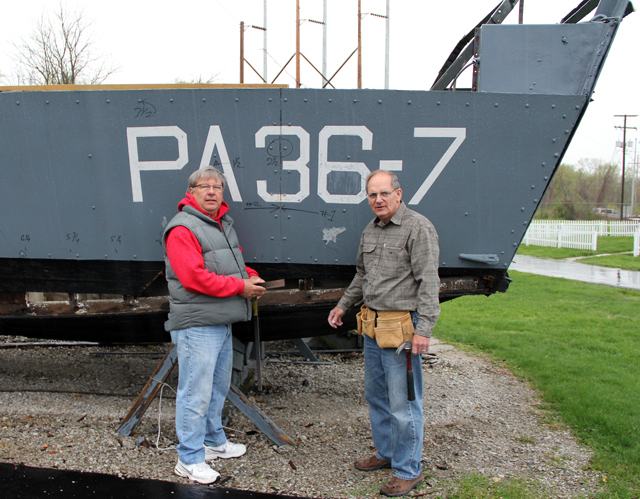 AEP retirees Roger Dyer (left) and Jim Michalec are helping to restore a historic World War II landing craft at the Mott’s Military Museum in Groveport, Ohio. PA-36-7 seems to have the cat’s luck of nine lives. A survivor of some of World War II’s fiercest battles in the Pacific, the historic landing craft is getting yet a new life and purpose, thanks to two AEP retirees and devotees of history who volunteered to get the craft shipshape for its next voyage. Sometime this summer PA-36-7 will arrive safely on a new “beachhead,” a concrete pad at Mott’s Military Museum in Groveport, Ohio, near Columbus. It will be the shortest and softest trip in the landing craft’s history, and, as a museum artifact, its easiest duty. The overland journey also removes it from the right-of-way of an AEP transmission line. Jim Michalec retired as staff engineer from AEP in 2010 after 39 years and is one of the nation’s experts in large motors and generators. At the restoration site, he operates a hand-held motor powering a circular saw. The awkward box-shaped boat being restored by Michalec and Dyer is a surviving “landing craft, vehicle, personnel” (LCVP) in the United States. The Navy produced 23,000 so-called “Higgins boats” during WW II to deliver marines, soldiers, supplies and jeeps to beaches in the Pacific, Mediterranean and Normandy, France, site of the largest allied invasion — which celebrated its 70th anniversary June 6. Fewer than 10 of the boats that saw action during World War II are known to exist in the United States. A stairway that leads museum-goers to a platform for peering into the craft lists the Pacific islands where American and Japanese armed forces fought gruesome battles: Marshall Island, Saipan, Tinian, Leyte Gulf, Luzon, New Guinea and Okinawa. 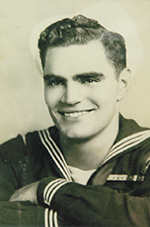 Sam Belfiore, a Silver Star Navy coxswain, piloted the low-draft 36-foot craft during the war. It was powered by a 225-horsepower engine and discharged its cargo by dropping its front-loading steel ramp. No longer useful after the war, the Navy scrapped the mostly cypress-plywood LCVPs by torching or sinking them. Sam Belfiore, a Silver Star Navy coxswain, piloted the low-draft 36-foot craft during the war. Photo courtesy of Mott’s Military Museum. Belfiore somehow saved PA-36-7 from the post-war scrap heap by shipping it from the U.S. naval base in San Diego to Lockbourne (now Rickenbacker) Air Base south of Columbus, his hometown and residence. During the Cold War, PA-36-7 was parked outside the U.S. Navy Reserve building at Rickenbacker. From time to time, it got a coat of paint and a few salutes. In the late 1990s, downsizing at Rickenbacker forced relocation of the Navy office and a new voyage for PA-36-7. Warren Mott, a former Army and AEP photographer and founder of the nonprofit military museum, had long sought the landing craft for his collection of military memorabilia. At first, a group in Dayton took possession of the LCVP, promising to restore it. However, the new owners lost interest, so the historic treasure was beached in Worthington, north of Columbus, and left to rot. Belfiore eventually rescued his beloved boat again, this time by informing Mott of its availability. Mott jumped at the opportunity to acquire the rarity. The LCVP travelled some 30 miles to the museum aboard a flatbed trailer in 2000 and then was lifted into place by crane. Later, Mott and Belfiore organized a reunion of surviving WW II veterans who had a “history” with the landing craft. Dyer got involved in the restoration in a roundabout way. His golf partner mentioned that Mott was seeking volunteers to restore a replica of the home of U.S. military flying ace Eddie Rickenbacker, the Columbus aviation hero and namesake of the airbase, on the museum’s grounds. Dyer recommended Michalec, an ace woodworker. Besides their AEP connection, Dyer, Michalec and Mott belong to Honor Flight, an organization that has paid for 3,200 Central Ohio World War II and Korean War veterans to visit the historical monuments in Washington, D.C. Returning the favor, Michalec “roped” (Dyer’s word) his friend to the museum to restore the LCVP. What Dyer thought would be a few weeks of work has become an effort spanning several months. The boat’s poor condition and last winter’s nasty weather slowed restoration. Lacking original building plans, they taped together the boat’s rotted wood timbers to make a template for fashioning replacement parts. Working around historical artifacts is sometimes solemn and ghostly. Seventy years ago, on June 15, 36 marines huddled in the bay of PA-36-7. Each privately reconciled with his terror, and awaited the order to charge when the ramp splashed into the drink. They raced toward the already crimson-stained beach at Saipan, a forsaken island in the Mariana chain. They would rather get tanned on Saipan beach, than shot. Cold waves soaked boots and uniforms, salt water slapped faces, then roars, screams, orders, chaos. Sam Belfiore would return PA-36-7 to an awaiting ship and then convey another platoon to shore. Thanks for what you are doing Roger and Jim. Men like you are doing a great job in keeping the history of WW2 and those that fought alive for all future generations to remember the sacrifices these young men and women made.